The Neighborhood Nurse Center is a Penrose-St. Francis Mission Outreach Program that has six community crisis sites. 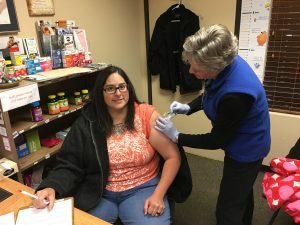 Penrose-St. Francis provides a Faith Community Nurse at Tri-Lakes Cares to work with the uninsured and the underinsured. Healing is profoundly spiritual, and Penrose-St. Francis, as a faith-based organization, has a commitment to the whole person. At the Neighborhood Nurse Centers, the physical, emotional and spiritual health and wellbeing is assessed by a Faith Community Nurse, a registered nurse with specialty training and expertise in coaching individuals through medical issues that may have foundational spiritual or social issues underlying a medical need. 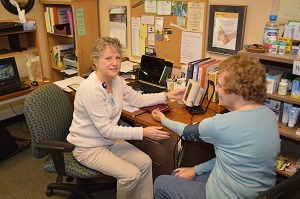 Penrose-St. Francis Health also offers a free Volunteer Medical Clinic at Tri-Lakes Cares to provide safety-net primary care until a medical home can be found. A volunteer doctor is available by appointment on Tuesdays. Tri-Lakes Cares loans out durable medical equipment based upon availability to include wheelchairs, walkers and shower chairs. Nursing services are available on a walk-in basis, Mondays and Thursdays, 12 to 3 pm. To make an inkind donation of medical equipment or over the counter medication. Please note that we are not able to accept donations of prescription medications.